This is a bummer. 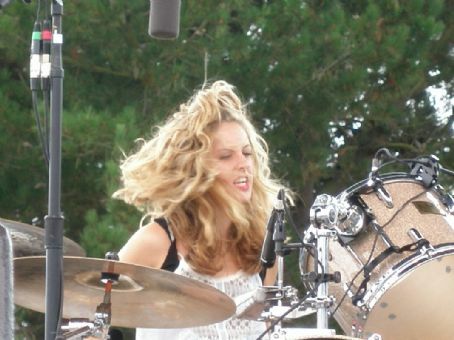 Torry Castellano (aka “Donna C”), drummer for The Donnas, has been forced to quit the band and completely retire from playing drums due to a chronic, severe shoulder injury. I interviewed Torry several years ago and she was lots of fun. This is really a shame, as not only are The Donnas an awesome band, but I know how passionate drummers are about their craft. No one wants to be forced into retirement due to an injury, but her decision makes sense considering that she was faced with having to choose living without pain over pursuing her art. You can read Torry’s heart-felt statement to her fans at this link. Good luck Torry, you will always continue to rock in my book! ← Chicago Unveils Giant Eyeball Sculpture! As a huge Donnaholic, I’m totally heartbroken. You could read Torry’s passion on her face when she played live. She’s a sweetheart, too. Since her pre-shoulder / wrist injuries, The Donnas were forced to slow down a lot of their more punk oldies when playing live, which was always sort of a bummer. Goodbye, Donna C – thanks for the rockin’ times – we’ll miss ya. God, am I seriously bummed:( I will pray that God heals her because she BELONGS with The Donnas! She did, indeed, give 110%, and as far as I’m concerned, she can give Lars Ulrich a run for his money anyday…and I’m a Metallica fan! And anybody who doubts that needs to watch her on YouTube playing Do You Wanna Hit It live, man, she just TEARS up those skins!!! She is right up there with Lars and Joey Jordison, as far as I’m concerned, and Torry…ye broke me heart, lassie:( I, too, am sad:( Man, this is worse than when Virginia Hey had to stop playing Zhaan on Farscape because of the blue makeup causing her kidney damage. Torry…through God, you WILL play drums again, THROUGH GOD, ALL THINGS ARE POSSIBLE!!! IF RICK ALLEN COULD DO IT, SO CAN YOU!! CAN I GET AN AMEN?!?!?!? !